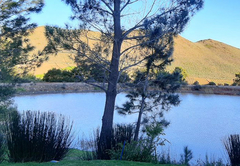 Bergland Accommodation is a property providing self catering in Worcester for tourists visiting the Breede River Valley region. 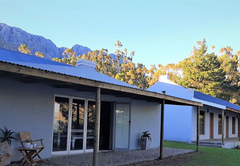 Situated on a working wine and fruit farm at the foot of the Olifants Mountain, Bergland Accommodation is, approximately 15 kms from Worcester and an hour's drive from Cape Town. 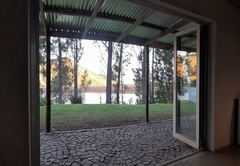 Bergland boasts unobstructed views of the Breede River. 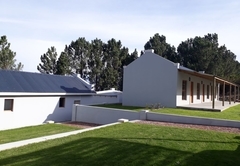 The self catering accommodation comprises 10 bedrooms, a two bedroom cottage and four chalets. 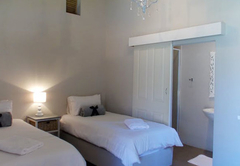 The bedrooms are located next to one of the farm dams and are furnished with either a double bed or two single beds dressed with quality white linen and towels. 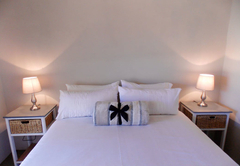 Each room has its own, private en-suite bathroom and is equipped with tea and coffee facilities. 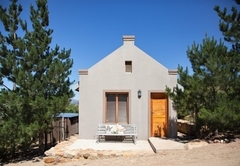 Surrounded by vineyards and boasting a lovely view of the mountain, The Cottage has two bedrooms which interlead through a shared, en-suite bathroom. 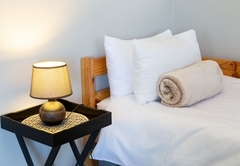 Each room is furnished with a double bed and has tea and coffee making facilities. The Chalets are also surrounded by the vineyards and have beautiful mountain views. 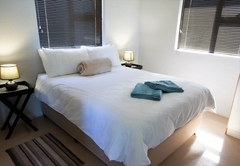 The one bedroom chalets are furnished with a double bed in the bedroom and a single bed in the living area. Linen and towels are provided. 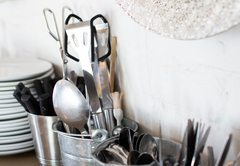 The open plan kitchen is equipped with a fridge, toaster, microwave, electric frying pan, coffee / tea making facilities, crockery and cutlery. 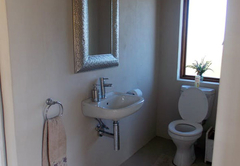 These chalets do not have private bathrooms but share stylish bathrooms just outside the units. 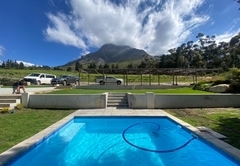 Braai facilities are also available for guests' use. 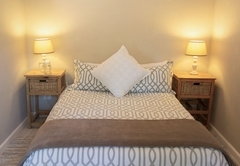 The two bedroom chalets are furnished with a double bed in the main bedroom and two single beds in the second bedroom. Linen and towels are included. They each have a well equipped open-plan kitchen, a lounge as well as a bathroom with a shower, toilet and basin. 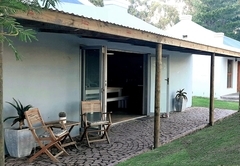 Braai facilities are also available for guests' use. 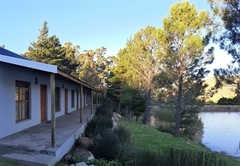 A farmstyle Lapa is located on the banks of the farm dam, only a few steps from the accommodation. The Lapa has a communal kitchen for all of the bedrooms to make use of. These include a fridge, microwave, two plate stove and coffee / tea making facilities, crockery and cutlery and dishwashing facilities. 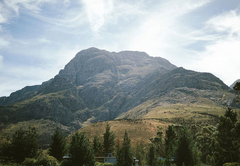 Enjoy the relaxing atmosphere with hiking and mountain biking trails to explore the area. 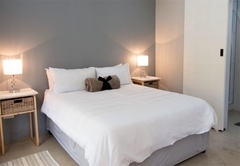 The bedrooms are furnished with either a double bed or two single beds dressed with quality white linen and towels. 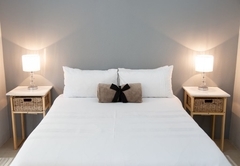 Each room has its own, private en-suite bathroom and is equipped with tea and coffee facilities. 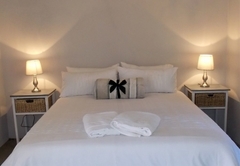 The Cottage has two bedrooms which interlead through a shared, en-suite bathroom. 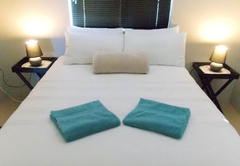 Each room is furnished with a double bed and has tea and coffee making facilities. 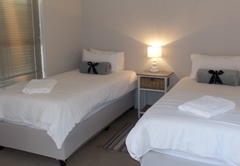 The one bedroom chalets are furnished with a double bed in the bedroom and a single bed in the living area. Linen and towels are provided. The open plan kitchen is equipped with a fridge, toaster, microwave, electric frying pan, coffee / tea making facilities, crockery and cutlery. 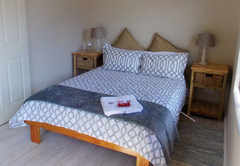 The two bedroom chalets are furnished with a double bed in the main bedroom and two single beds in the second bedroom. Linen and towels are included. 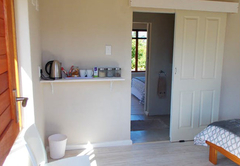 They each have a well equipped open-plan kitchen, a lounge as well as a bathroom with a shower, toilet and basin. Child policyChildren of all ages are welcome. Children are the full responsibility of the parents and great care must be taken if any of the guest with children are going near the dams on the farm.